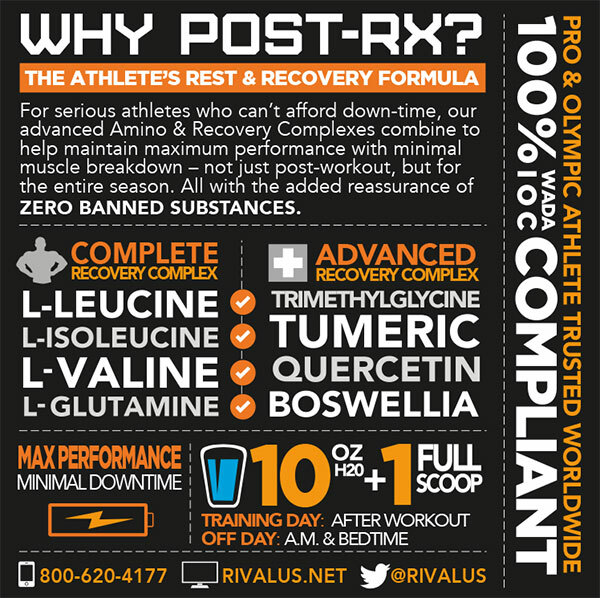 Post-Rx is an advanced complex designed to support the post-workout recovery needs of hard-working athletes. A 6.5g blend of L-glutamine and BCAAs plus trimethylglycine support muscle volume and rebuilding, while a recovery complex of boswellia, quercetin, and turmeric help modulate exercise-induced inflammation. Mix 1 scoops with 8-10 fl. Oz. of cold water and consume immediately after training or competition. 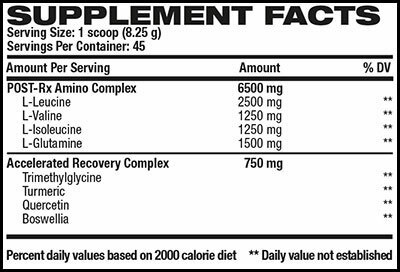 On non-training days, take 1 scoop of POST-Rx in the morning and 1 scoop before bed. 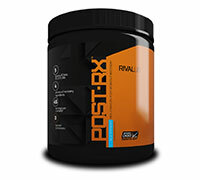 For best results use POST-Rx everyday in conjunction with a high quality protein and combine with exercise 3-5 days per week. Ingredients: Natural and Artificial Flavors, Citric Acid, Malic Acid, Silica, Sucralose, Acesulfame Potassium, FD&C Blue #1. Allergen Information: Manufactured on equipment that process products containing milk, soybeans (lecithin), peanut flavor, wheat, shellfish, tree nuts, fish oil and egg. KEEP OUT OF REACH OF CHILDREN. Warning: Consult a physician before using if you are unaware of your current health status, if you have a medical condition, or if you or your family has a medical history of cardiovascular disease, diabetes, psychological disorders, hormonal abnormalities, or if you are taking any prescription drug. Do not exceed maximum daily dosage. Do not use if safety seal is broken. Contains ingredients derived from milk. Store in a cool, dry place.